Abuse of A Vulnerable Adult – out of anger and as fulfillment of his expressed threats that he is at “war” with me, that he will “destroy” me, and that “misery” is what I deserved, Arthur has forced me to live in poverty in an unfit, unsafe and dangerous place. Arthur is my husband. He controls 100% of our finances. He uses this absolute control to abuse me physically and emotionally. His conduct is Abuse of a Vulnerable Adult as described in Federal and State Law. 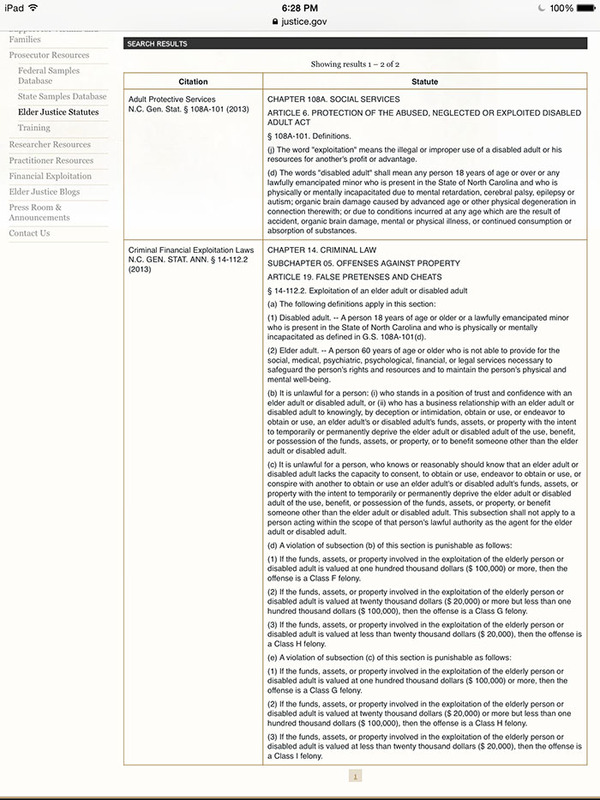 Here below are the North Carolina General Statutes about Abuse of a Vulnerable Adult. Arthur said repeatedly that he would destroy me, destroy my life if I ever spoke about his years of illegal, unethical and immoral conduct. And that is what he has been allowed to do, for years. So, I lived in hell, while Arthur lived in luxury. I borrowed thousands and thousands of dollars to keep the Logres Farm animals alive. Arthur (a.k.a. Dr Arthur Greenwood, or USAF Maj. Arthur Greenwood) knows to the penny what these animals need and what it costs to keep them healthy. He also knows that there is no market for starving horses, and that they will end up in killer auctions. He knows the emotional damage to dogs, that do not have enough one-on-one time when they are young. Arthur knew he had signed about 40 contracts with dogs bred and sold by his business Logres Farm, that obligated him to be involved in medical care and other health and training decisions for the Logres Farm dogs. Those obligations did not just disappear because Arthur decided to hide from Service of Process. Arthur did not care about any of his obligations or responsibilities to the Logres Farm animals. Arthur knows the facilities on this rental property and he knew there were not fit or safe facilities on this property BEFORE he dumped the horses here on December 2, 2014. Arthur knows to the penny what it costs to provide food, shelter, vet care, training, farrier care, emergency vet care and other necessities for these assets of his Logres Farm business because he has deducted these expenses from his Federal Income Taxes every year since 2003. Here is an example of the costs of caring for the Logres Farm animals. There is no question that the United States Air Force knew that Arthur had abandoned me and the Logres Farm Animals on January 9, 2015. when Arthur refused to arrange for food for the Logres Farm animals, in the midst of the coldest winter on record in North Carolina, all while Arthur knows that “his horses” have NO shelter of any kind, and no way to get out of freezing rain and snow. Spousal Abuse – years of physical and emotional abuse, threats. neglect of my basic health care (medical an dental) needs, while Arthur Greenwood lived in luxury in a second home he insisted we have, where Arthur was partying, committing adultery, his weight ballooned to 300 lbs. Arthur John Greenwood has as never gone without medical or dental care, and all while Arthur was moonlighting illegally, which put thousands of North Carolina civilian patients lives at risk, and while Arthur was spending all of our money, well over a million dollars on his Logres Farm business goals. Domestic Violence: throwing things at me, threats of violence, which escalated to pushing and then shoving me in to walls, doors, throwing me down a flight of stair and throwing me to the ground. over half a dozen emergency room trips since 2005.